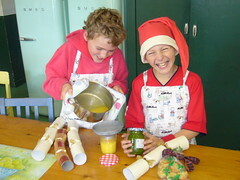 Some of our most cherished childhood memories center on food preparation, and Christmas is a fantastic opportunity for getting children into the kitchen. Homemade gifts have personal appeal, and with thought children can add their own twists to traditional recipes. This mincemeat recipe contains no alcohol but you can substitute the fruit juice for something stronger - with parental permission. It is also nut free and uses vegetarian suet. Reduced fat varieties are now available. Mincemeat is a no-cook recipe and adapts well to the classroom setting – lots of weighing, chopping and stirring. You can add peeling too, if you would prefer to peel the apples – it is not necessary. Makes 6 jars ready to bake your own mince pies! 1. Wash the lemon, lime and one of the oranges. Grate the rind from the citrus fruits, but be careful not to grate the pith (white) of the fruits. Put the rinds into the mixing bowl. 2. Cut all of the citrus fruits in half. Twist the halves around a citrus squeezer to get the juice out. Put the juice in a measuring jug. 3. Weigh out the apricots and cherries and younger children can use a rounded ended knife to chop them into small pieces. Put the chopped fruit into the mixing bowl. 4. Weigh out the dried fruit, cranberries, sugar and suet and add to the mixing bowl. 5. Add the chopped apple, fruit juices and spices to the mixing bowl. 6. Place a damp cloth under the mixing bowl (to stop it from moving) and gently stir the ingredients together. Little stirs, keep everything in the bowl. 7. Cover the bowl and leave the mincemeat in a cool place for 24 hours. 8. Use a dessert spoon to carefully pot the mincemeat into sterile jam jars. Cover the jars with a lid and store in a refrigerator until use. Use equal quantities of dried fruits e.g. sultanas, currants and raisins. Always cover wounds before cooking; this is especially important when juicing lemons because the juice can sting. Use a whole nutmeg to grate your own nutmeg powder. Find out what mace is. Try changing the dried fruit – use chopped tropical dried fruits or dried blueberries instead. Make ‘designer covers’ for the pots of mincemeat and give them away as Christmas presents. This was posted on Saturday, December 1st, 2007 at 1:20 pm by Ysanne. To link here, use the permalink. You can follow any responses to this post through the RSS 2.0 feed. i had no idea there was such a thing as veg suet… what the heck is in it? I’m not sure if they make vegetarian suet in the US, but there are two kinds that I know of in the UK. The first is a mainstream brand named Atora who make traditional beef suet and also a vegetarian alternative. Atora products are available in stores all over Britain and also from specialist European stores in the USA. Atora Vegetarian Suet is made from hydrogenated vegetable oil, so I don’t recommend it, as hydrogenated fats are known to be very unhealthy for your heart. However, there’s a great organic vegetarian suet made by an independent British food coop named Community Foods. It’s made from palm oil, so while not being something you’d want to eat by the spoonful, it’s a natural food that works just like the beefy version.